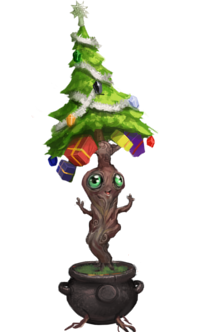 On 15th December, Douglas – the Christmas pet of seasons – comes to Solomon's Store, and everyone who owns the original, full pet of seasons gets him for free! Douglas will be available from 00:00 UTC on the 15th of December. Note that only those with the pet of seasons unlocked before then will get Douglas for free. Just having a pet of seasons token doesn't count. Be sure to redeem it before then if you'd like to take up this offer! Douglas is a thoroughly festive fellow – topped with tinsel and bedecked with presents. He's a companion pet, meaning he can override familiars, and comes with his own attack, special attack and defence animations. He'll be available at Solomon's for 217 RuneCoins, or 195 for members – equivalent to just one Bond. When Douglas is released, all existing pets of seasons will be upgraded to companion pets, complete with the new animations. However, note that pets of winter, spring, summer and autumn will remain as follower pets. Douglas is only available over the Christmas period, so be sure to get him while you can! We wanted to let you know about this special offer now so you didn't miss out. We're looking forward to seeing Douglas in game, spreading some festive cheer. Shame I'm not considered eligible with two pet tokens. Cute pet though. An attorney defends a man sued for walking around town in his underwear. It was a brief case. You lot moan to how hard it is to make animations for overriding pets(e.g the boss pets promised) but you go along and ***** nilly make stuff like this for overrides with a full set of animations. I don't really know what to believe anymore, I feel like we the community are being cheated on for money over fun. Which... ironicly won't be the first time. Haha, is Douglas' middle name "Fir" by any chance? I'd be lying if I said the Pet of Seasons/Xmas pet were well designed. They're absolutely horrendous and I have no idea why anyone would actually use it. Please make the individual season pets follower pets. Got the coins ready, can't wait! Know your limitations, and then ignore them. He is so cute! Thank you for allowing us to get it for free if we have the other pet of seasons, looking forward to changing between this and my Rory during December.